The 2019 Subaru Forester marks the beginning of the station wagon-based compact crossover's fifth production cycle, or the "SK" generation of production. Unveiled at the New York International Auto Show on March 28, 2018, the vehicle is split into five trims: a base-level model, the Premium, the Sport, the Limited, and the Touring. Standard exterior features on the new Forester include auto on/off LED headlights, folding side mirrors, and 17-inch steel wheels. The Premium trim is upgraded with a roof spoiler, raised roof rails, and 17-inch black machine-finished alloy wheels. The Sport gets turn-light indicators and heating ability on the side mirrors, a chrome finish on the exhaust tip, a power liftgate, and 18-inch black machine-finished alloy wheels. The Limited has fog lights and 18-inch split 5-spoke black machine-finished alloy wheels. Exclusive to the Touring are LED fog lights and satin chrome finish on the side mirrors. The latest Subaru Forester is a two-row vehicle that can seat up to five people. For the most interior space, go with the base-level model, which provides a passenger volume of 111.9 cubic feet and a standard cargo volume of 35.4 cubic feet with the option of expanding it to 76.1 cubic feet when you lower the rear seats. The other four trims have a passenger volume of 107.8 cubic feet, a standard cargo volume of 33 cubic feet, and an optimized cargo space of 70.9 cubic feet. Front seating consists of a 6-way manually adjustable driver's seat and a 4-way manually adjustable passenger's seat. At the Premium trim level, the Forester is upgraded with 10-way power adjustability and power lumbar support on the driver's seat, and it gets a leather-wrapped steering wheel. Heated front seats appear if you go with at least the Sport, which is the only variant with racing-style upholstery accentuated with orange stitching. Leather seat trim replaces cloth on the Limited and Touring. And the Touring is unique with its rear heated seats, an 8-way power-adjustable driver's seat, a heated steering wheel, and a 2-position memory system. 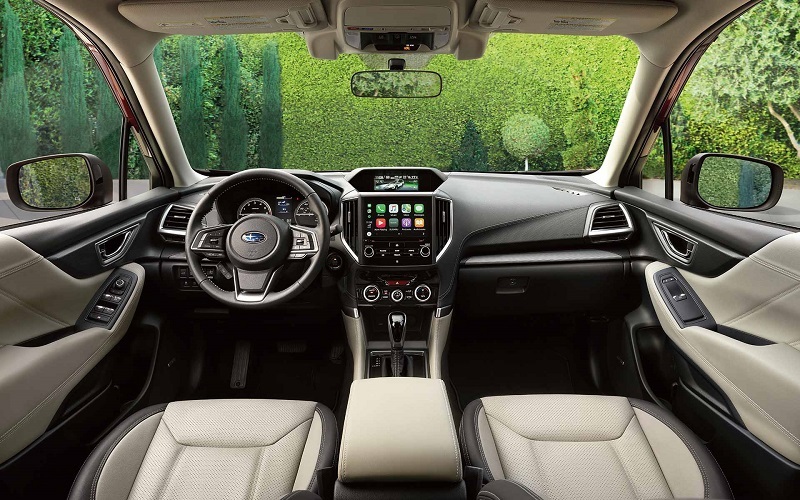 Standard comfort and convenience features on the Subaru Forester include a monochromatic multifunction display, cargo-area underfloor storage, STARLINK™ infotainment integration, four-speaker audio, an AM/FM radio tuner, a single-disc CD player, Android Auto™ and Apple CarPlay™ for smartphone integration, HD Radio®, Bluetooth® wireless technology for audio streaming and hands-free phone operation, dual front-row USB ports for playing media via mobile devices, a four-month trial subscription to SiriusXM® Satellite Radio, and a 6.5-inch color touchscreen. Upgrading to the Premium would add a removable cargo area tray, a panoramic power moonroof, and 4G LTE Wi-Fi capability, and upgrade the audio system with six speakers instead of leaving it at four. At the Sport trim level, Subaru introduces two rear-seat USB ports, a color multifunction display (instead of the monochromatic one), and keyless access with push-button ignition. The Forester welcomes dual-zone automatic climate control, an 8-inch color touchscreen (in place of the 6.5-inch), and an auxiliary audio jack at the Premium trim level. Exclusive to the Touring are a voice-activated 8-inch touchscreen navigation system and a 9-speaker 576-watt Harman Kardon stereo system. The Subaru Forester relies on a strut-type front suspension and a double wishbone rear suspension for a cushioned ride on any type of terrain. With electric power-assisted rack-and-pinion steering, the vehicle has a turning circle rating of 35.4 feet. Powering the 2019 Subaru Forester is a 2.5-liter flat-4-cylinder engine, which generates 182 horsepower and 176 lb-ft of torque. The engine comes with an automatic stop-start system for eliminating engine idling and thereby improving fuel efficiency. Glued to the engine is a continuously variable transmission, which gets rid of gear shifting for a much smoother ride. However, for a little more excitement, go with the Sport or Touring, since either one has additional paddle shifters for more driver control. The Forester has standard all-wheel drive, with X-MODE® for even better tire grip on the road. 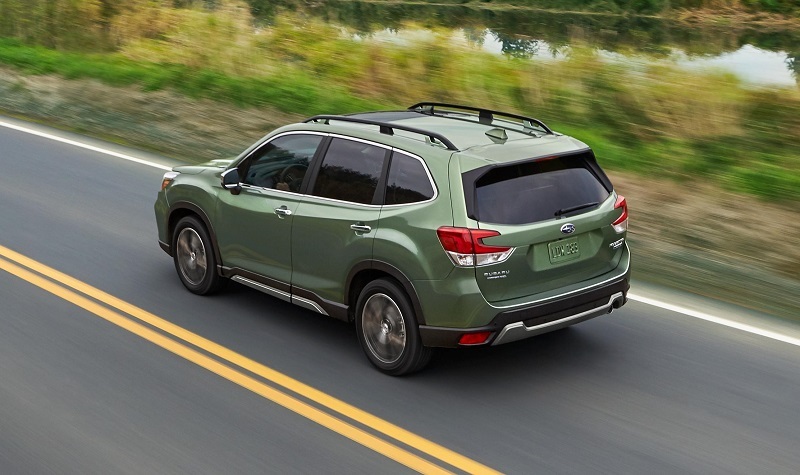 Restraint and cushioning on the 2019 Subaru Forester is provided by two front impact airbags, two front seat-mounted side-impact airbags, a driver's knee airbag, and two roof-mounted side curtain airbags. Also on board are a rear vision camera, vehicle dynamics control, traction control, four-wheel anti-lock disc brakes, active torque vectoring, trailer stability assist, brake assist, brake override, electronic brake-force distribution, daytime running lights, and the EyeSight® driver-assist technology suite (for functions such as adaptive cruise control, lane keep assist, lane departure and sway warning, and pre-collision braking). Security is provided by a theft-deterrent system that combines keyless entry with engine immobilization. Go with the Premium or a higher-level trim if you also want hill descent control. At the Sport trim level, Subaru adds high beam assist. The Limited and Touring stand apart from the other trims with the addition of blind spot detection and rear cross-traffic alert, as well as steering responsive headlight technology on the headlights. Only the Touring has a drive distraction mitigation system and reverse automatic braking. Ready for a test-drive of the 2019 Subaru Forester near Thornton? Call us at Flatirons Subaru, which is known for serving Thornton Colorado shoppers, to set up an appointment. Based in Boulder, Flatirons Subaru has established a reputation for serving Thornton Colorado residents, as well as the surrounding areas. 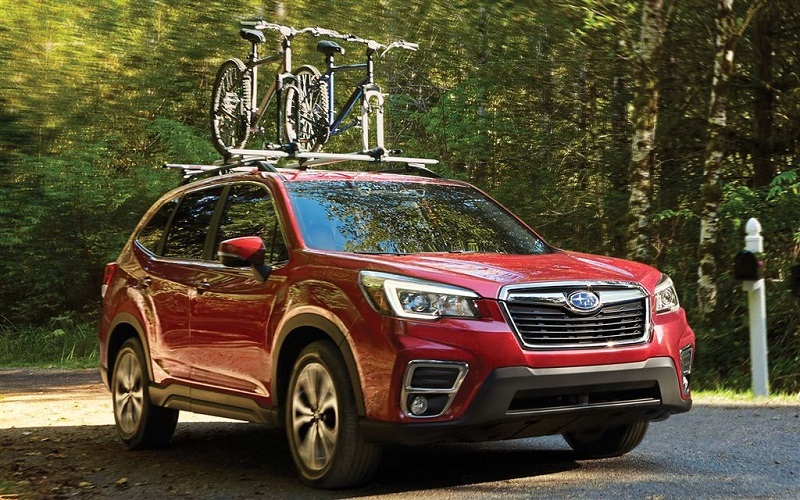 Set up an appointment to test-drive a 2019 Subaru Forester near Thornton at Flatirons Subaru. One of our sales experts known for serving Thornton Colorado will be more than happy and willing to help you with driving off with the right Forester for you.